In Tuscany, game meats are really well known, as is high quality beef. There, meat is prepared with fresh herbs and simple seasonings, allowing the natural flavors of the meats to shine through. With this steak, very little preparation is needed, because if you start off with quality steak, you really won't need much seasonings. We really enjoyed this steak because not only was it so easy to prepare, the aroma and flavor of the rosemary, sea salt and pepper just added the right amount of flavor without overpowering the natural taste of the steak. So the next time you want to prepare steak, give this Tuscan version a try! Press chopped rosemary onto both sides of porterhouse steak; set onto a plate and allow to marinate at room temperature for 1 hour. Start an outdoor grill using hardwood charcoal, such as hickory. When coals are white and glowing, arrange for high heat. Gently brush or rub olive oil onto steak, then season to taste with sea salt and pepper. 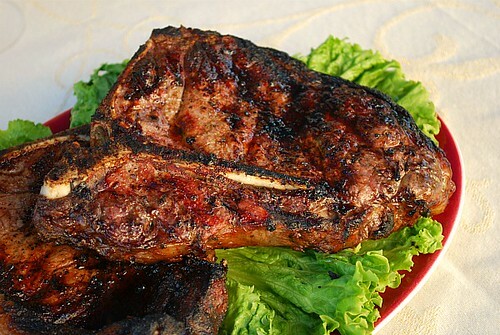 Place steak onto grill, and cook until a dark, golden brown (not burnt) crust forms, 5 to 10 minutes depending on thickness of meat. Turn over, and continue cooking until golden on the other side, 5 to 10 minutes more. When finished, place steak onto a platter, and allow to rest for 10 minutes. Finish by garnishing the platter with lemon wedges and a sprinkle of additional sea salt. There's nothing that makes me happier than a grilled steak! Plus rosemary? Yum! They like their steaks red! The flavors sound amazing.